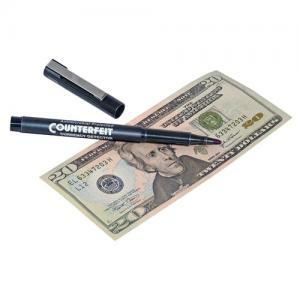 Pen-style counterfeit detector offers a quick and simple way to prevent fraud by detecting counterfeit currency. Ink works to react with the starch in wood-based counterfeit paper to leave a dark mark and expose false currency. Just mark a small line on the bill and observe results. Amber indicates a genuine bill, while black or dark brown means the bill is suspect. Detector is protected by naturally occurring, antimicrobial technology that protects against the growth of bacteria and fungus on the surface of the pen. Detector includes a holder.